Ceramicist Maria Poliszuk knows the answers to a new person’s questions about working clay, even if they don’t know to ask. She introduces you to pottery in a crash course - an intense four sessions with lectures as well as time to practice technique. Learn the wheel, hand building techniques, sgraffito, piercing, and slab rolling. Gain the confidence to continue learning...or at least be able to check it off your bucket list! Class meets Tues., Apr. 30 - May 21, 6:30-8pm. This is a beginner’s class for adults and youth over 16. 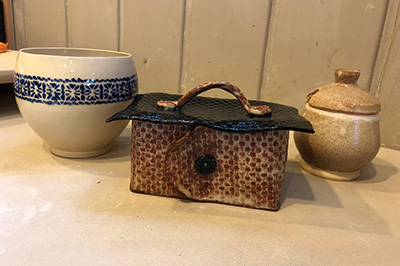 More experienced potters who wish to learn with Maria and returning potters who want a refresher will benefit from this class. Price is $98 plus $10 supplies plus a $4/piece firing/glazing fee. Wear clothes that can get dirty.